I give big kudos to my friends over at bulkammo.com, as they have been patiently waiting for over 6 months to me mange to get a post out on a box of ammo they sent me. After initially discussing what I would be interested in testing, they agreed to send me a box of their 55 Grain Fiocchi PSP cartridges. 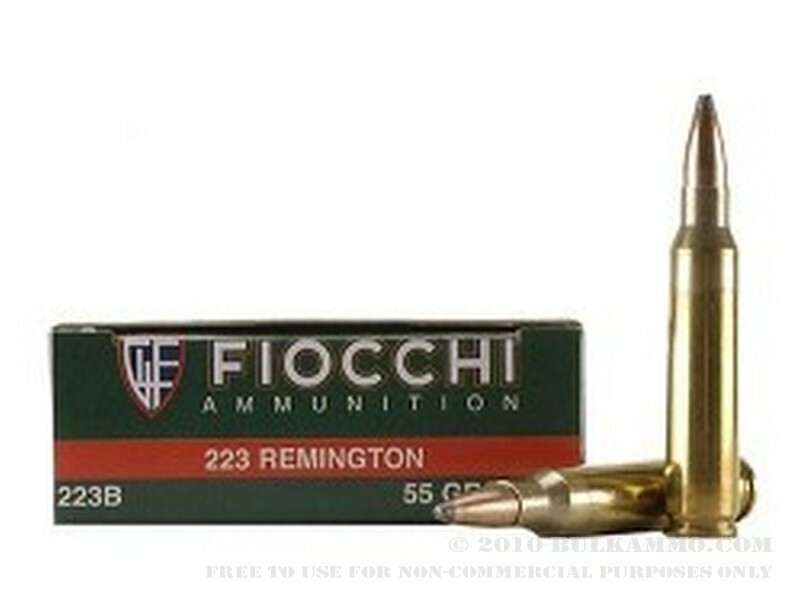 What impressed me most about this ammo is its ability to cycle flawlessly in my R15. This was a relief, as I patiently work my way through over 500 rounds of budget level Herter’s ammo, I purchased at Cabelas. What is most unfortunate about this budget level ammo is its less than stellar performance in my R15. More below on this cycling problem. In terms of hunting, inside of 50 yards there is little noticeable difference between the various .223 Rem. ammo types in terms of group size. Even the worst functioning ammo I have tested to date, is capable of pulling small enough groups to kill any predator from coyote to bobcat to prairie dog that manages to scurry, creep, crawl or scamper into that range. Stretch this yardage out, however, and you quickly begin to identify large gaps between individual shots. By the time you are out to 300 yards, shot inconsistencies not apparent at 50 yards are easily recognizable. When shooting at extended ranges buy the best ammo you can afford, to ensure you make an ethical kill shot at the animal you are pursuing. Lastly, when hunting it is vital that we examine a bullets ability to properly mushroom upon impact with a game animal and maintain its lethal nature despite what it may encounter. 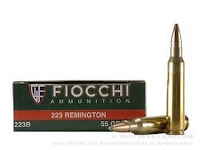 This "lethal" test remains yet to be determined with the Fiocchi PSP ammo and is likely to be determined sometime after the snows fall and coyote night hunting begins in the state of Maine. As the season for night coyote hunting begins around the middle of December, I am sure you will hear more about this tale in the near future! I'm predator ready my man, December vacation? I can see that despite your years of intensive tutelage in your valiant attempts to make me a man, I continue to disappoint. How about Jan 28th for a pike/yote adventure. Just this year please remember to bring a fresh change of underwear! I agree, I have seen a lot of "sportsmen" shoot and many are WAY beyond their abilities at 300 yards. With the AR15 in .223, seated and with an attached bi-pod, I can hit a tin can sized target consistently at 200 yards (9 for 10). This is a lethal combination on coyotes. Deer hunting in the thick Maine woods is typically 100 yards or MUCH less unless you are hunting a power line. I wouldn't attempt a shot beyond my "perceived" abilities on a deer BUT I would have no problems stretching my maximums on a coyote.